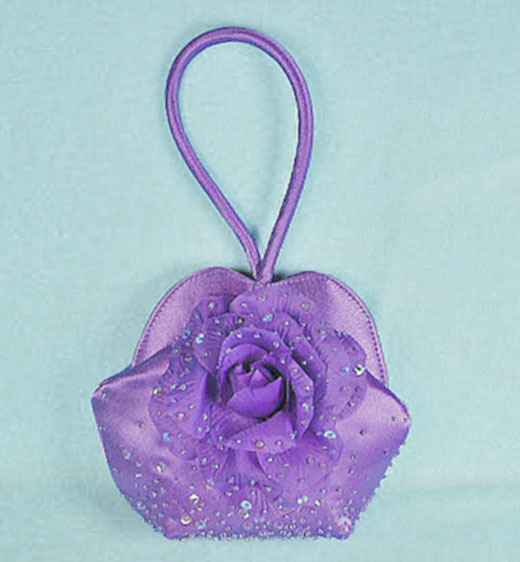 Pleated Sequined Round Evening Bag with Matching Handle This purse is a favorite evening bags for proms. It has an attached lovely beaded flower on the front with and there is beading around the bottom. The handle is a matching satin and it has a snap closure. It is available in pink, gold, silver, black, champagne, violet , brown,turquoise, royal, fuchsia, coral, mig and light pink colors. Color: violet Hue: Code: #CC00FF.